Review date: 20 September 2000. Need to shift a PC from one site to another? Not overseas - just across town. Annoying, isn't it? 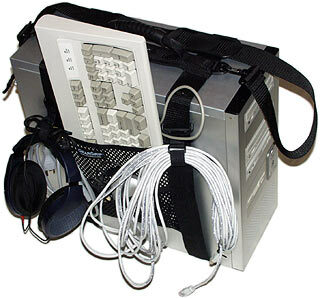 If it's just you moving the PC, then even if there's a monitor waiting for you at your destination, you still need to fill a bag with input devices and cables and whatever extras you need, then pick up a possibly quite weighty computer and wrestle it into and out of cars, up and down stairs, and so on. A simple handle would help, wouldn't it? Apple have carry-handles on their recent designs, but almost all PCs are plain metal boxes with nothing very grabbable anywhere. The CaseAce GearGrip Pro solves this problem. 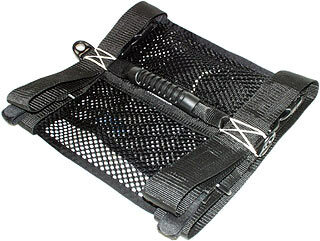 It's a simple to use, well made, strap-on computer carry harness, with cable holders, a couple of pouches for keyboard and mouse and what have you, and a clip-on shoulder strap, too. This is not exactly a patentable idea, of course. People have been making rigs to tote otherwise untoteable things around for ages; computers are just the most recent candidates. The universally accepted standard is a web of cloth-backed tape ("duct" or "gaffer" tape), which with sufficient layers can be used to make all sorts of things. A few companies make computer-specific carry-rigs. The GearGrip, though, is an excellent example of the breed. The Full Kit, as reviewed, suits mini and midi-tower cases, and costs $US34.95. There's a larger version that costs two dollars more, and fits full tower cases. The Australian dollar closed up a little against the Greenback today, so $US35 is probably now only about $15,230 in our money. The GearGrip comes in a plastic bag, folded flat and trussed up with a couple of rubber bands. It does not come in a humungous cardboard box chiefly filled with air. Disturbingly, this suggests that the CaseAce marketing people may, possibly, still be human. I'm sure a couple of refresher courses will remind them of their obligations. To cut costs, CaseAce provide fitment instructions only on their Web site, but strapping on a GearGrip isn't exactly advanced particle physics. Unfold the GearGrip, sit the computer on the straps, line up the handle at the top, click the buckles on, cinch the straps tight. The GearGrip only grips around the sides of the case, but it nonetheless holds very firmly once you've tightened the straps properly; there's no risk of the computer falling out. The standard-size GearGrip's meant to fit cases up to 52 inches (132cm) in circumference, but that's with enough strap hanging out of the buckles for you to easily grip it for tightening purposes. I tried the GearGrip out on my Lian Li PC-60 (reviewed here). It's a large midi-tower which is about 130cm around, and the GearGrip fit it fine, with about 7cm of strap still hanging out of the buckles. Most midi-tower cases are smaller than the PC-60; you'd have to have a pretty peculiar one for the plain GearGrip not to fit it. For bigger cases, the larger version fits cases up to 70 inches (178cm) in circumference. Since the GearGrip straps around the sides of the computer, it doesn't foul anything on the front or back panel, and you can leave it on the machine all the time. 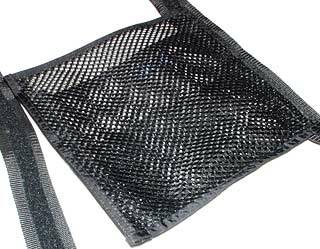 ...and the pockets on the side, which attach to the straps with "hook and loop material" - what most people call Velcro - so you can adjust their position to match the size of your case. There are a pair of adjustable "CableGrip" hook-and-loop-fastened loops attached to the straps, which you can use to hold cables and headphones and suchlike. I have my doubts about the wisdom of hanging your headphones off the side of your computer for transport, but the loops are nice to have nonetheless. The snap-together buckles, like the other plastic parts, are made of high strength fibre filled plastic, like the fittings on quality backpacks. The shoulder strap hooks on with this spring-clip carabiner jobbies. They are, again, very strong indeed, but the shoulder strap itself doesn't really work very well. It's got a rubber load-spreader, so it doesn't cut into your shoulder, but it's still awkward for most people to carry 15-odd kilos that way. The GearGrip Pro is the all-options version. 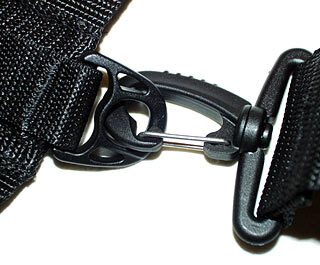 The Base Kit version of the GearGrip omits the shoulder strap and one of the CableGrip loops, and costs $US30.95. CaseAce also, by the way, sell brass thumbscrews to replace the normal hexagonal-head Philips screws that hold practically all computer cases together. They're handy things, for people that're forever taking cases apart to tweak hardware, and they cost $US2.50 for six or $US1.75 for three. 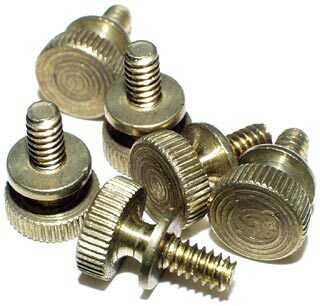 These are the plain brass ones; at the moment CaseAce are selling nickel plated ones for the same price. You don't want to trust a multi-kilobuck computer to a carrier of questionable solidity. The GearGrip is well made, easy to use, comfortingly secure, and gives you some extra storage to boot. Realistically, considering the amount of paraphernalia that people moving computers often also have to move, I don't think a GearGrip by itself is going to suffice for all of your techno-transport needs. But you can get a surprising amount of stuff into a GearGrip; add a small, cheap backpack for things the GearGrip can't elegantly hold and you'll be set. The target market for the GearGrip is the LAN party-goer. LAN parties are get-togethers of multiplayer game fans. Everyone plugs into a Local Area Network set up for the event and, to make a long story short, enjoys kicking the living excrement out of everyone else for as long as the party lasts. There are plenty of other people that could use one of these things, though. Anybody who finds themselves lugging a PC from place to place all the darn time will find the job considerably easier with a GearGrip. This isn't the thing you use when you need to move a computer by air. If you want a PC to have a good chance of surviving any kind of luggage handling, you have to put it in the kind of road case that carries NATO approval for the shipment of nuclear warheads. But for ordinary everyday computer portage, this thing's $US35 well spent. Recommended. 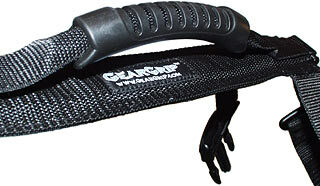 You can buy the GearGrip online from CaseAce Products. I've put handles on computers before. Like this one, for instance. Mind you, the handle was the least of what I did to that machine.